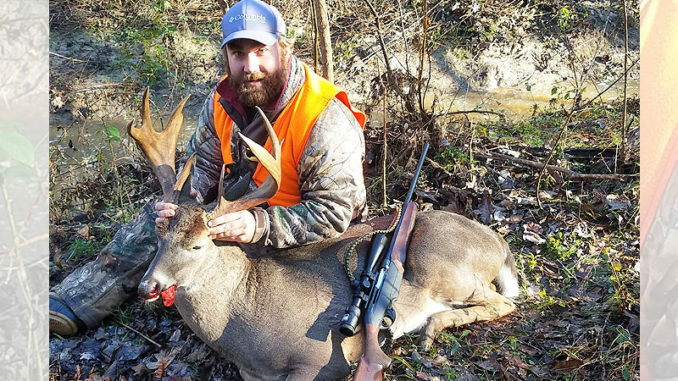 On New Year’s Eve of 2017, Mason Nooe saw a big buck with heavy palmation chasing a doe. Despite windy conditions and a long shot in fading light, he took a chance. “I hit him in the throat and it must have bounced off the collar bone,” Nooe said. “They winded me and were about to bolt and I took a 230-yard shot in a 25-mile-per-hour crosswind. Fast forward to Dec. 22 2018 to the same stand overlooking the same gas pipeline. Nooe got another chance on the first day he could hunt this season. 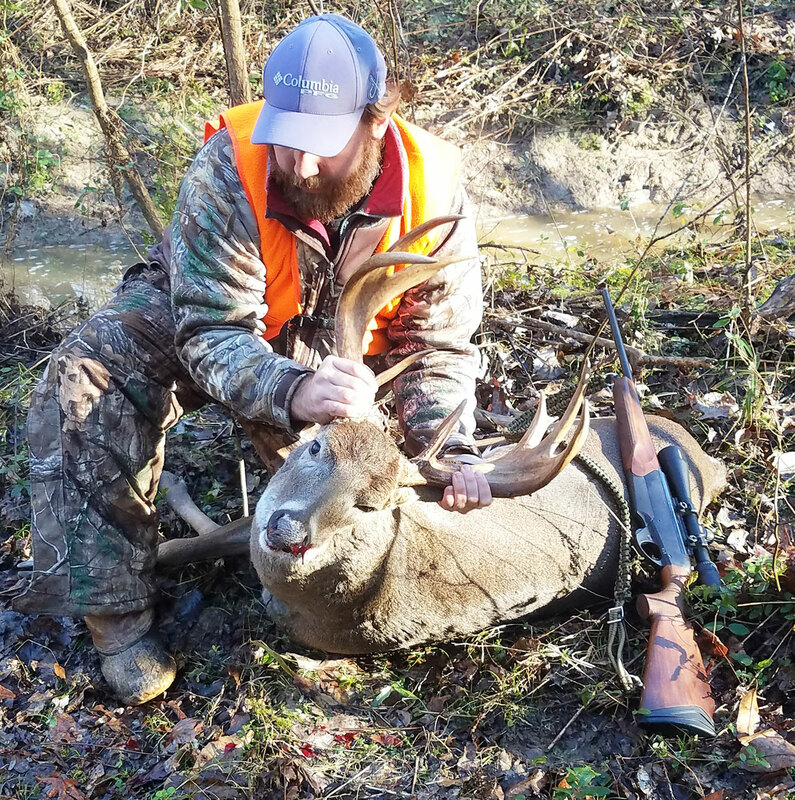 Mason Nooe made the most of a second chance at this odd palmate buck in Rankin County, putting him down on Dec. 22. 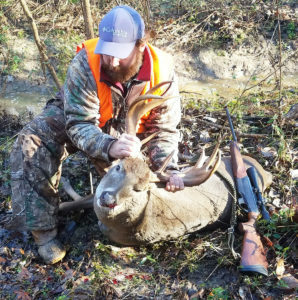 “It was a morning hunt, about 8:15, on our family land near Pelahatchie in Rankin County,” said Nooe, a Mortgage Originator in Flowood. “I was in the exact same stand overlooking this long pipeline. I got in there before sunrise and I started seeing deer right away. They were chasing pretty hard, and I could see them running in the trees and the field. The action was steady and the hunter was ready, his head on a swivel. 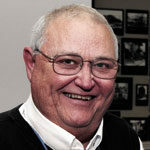 “I was looking around and at about 8:15, a doe came trotting out of the trees into the pipeline,” Nooe said. “She was flicking her tail and looking back behind her. I knew immediately something was up so I got my gun ready and by the time I got the scope dialed down from 12 to about 5 or 6, he came barreling out. The doe took off and cleared the pipeline, but the buck never took his eyes off his prize. Mason Nooe’s buck killed Dec. 22 in Rankin County had moose-line palmation on both sides of its rack. Nooe sent one down-range from his Bonnelli R1 .30.06, the same gun that he had used nearly a year ago. This time, it was on target and the big buck went down. Nooe didn’t need the trailing dogs, but he felt the need to call the same guys. “I wanted to tell them they were right about seeing that buck again,” he said. 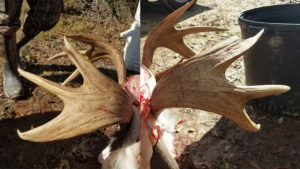 The buck had a 10-point main frame, but one point on the right side had been broken off. Whatever that number is most of it will come from its incredible mass, which because of palmation will yield at least two measurements in the 10-inch neighborhood. Not many are, at least not in Mississippi, where we only have whitetails and no moose.